You love movies...especially at the theater, where the big screen and big sounds put you in the middle of the action. Image having the same experience at home. Behrens can bring the theater to you. 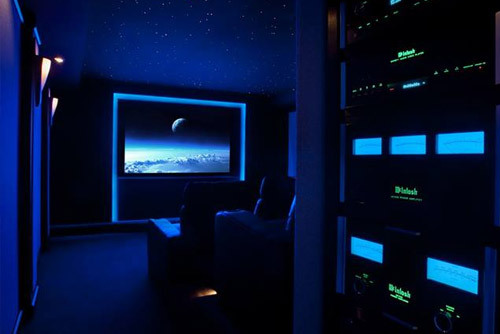 We can design a high-quality system with all the features of the cinema but in the comfort of your home. Enjoy the theater experience, minus the large crowds, uncomfortable seats and sticky floors. Of course home theaters aren’t just for movies, sports enthusiasts also find much to enjoy. Instead of watching on the old family room TV, you could be reclining in front of a large high - definition television, or projection screen, encased in sound that makes you feel like you are at the game. Imagine having friends and neighbors gather in your theater to watch the big game. Having a home theater system is the next best thing to having a season pass for all the major events. Does your family like video games? How cool would it be to play Halo on a 100” screen? Imagine jamming with Guitar Hero in full surround sound! Behrens has over 38 years of experience in designing and installing theaters to fit all budgets. From family rooms to full-blown, lavishly decorated, acoustically tuned dedicated theaters we can bring your dream to life. Make an appointment at our Jacksonville showroom to experience our two home theaters!